Last year we joined a volunteers in mission group, NOMADS. We knew a little, but not much, about NOMADS when we joined. 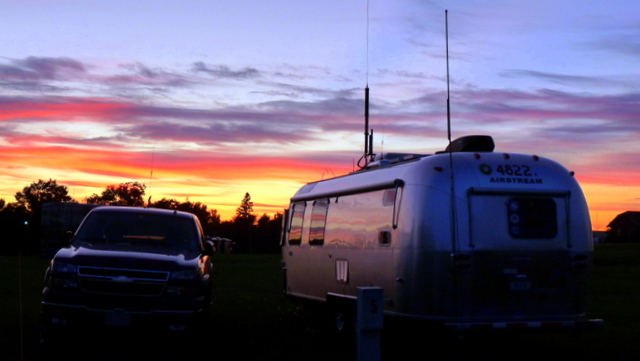 An amateur radio and airstreaming friend, Suzanne K5UUU, first told us about it and we filed the info away. We were luxuriating in the comforts of our home (on wheels) in south Florida during February last year. Remember what happened in Haiti? We watched with horror the helplessness and needs of the Haitian people. And we realized we could do more than just sit on our duffs all the time. So we joined SATERN, an emergency radio network operated by Salvation Army, and NOMADS, a volunteer mission group of the Methodist Church’s Board of Global Ministries. We’ve not done much with Salvation Army other than check into their nets occasionally. But we’ve completed two three-week mission trips with NOMADs and are interested in more. This year’s NOMADS annual meeting is in Forest City Iowa, kinda sort of on our way from North Carolina to Arizona. We signed up for a 3-week mission trip in southern Kansas and arranged to be in northern Iowa for the annual meeting. We’ll let you know how the mission trip turns out, we start in two days. But first we drove from NC to Iowa and headed for Slater IA to see friends. We were lucky to spend four days in Slater Iowa, just south of Ames Iowa, with snowbird friends Janet and John. They are perfect hosts, sharing their house AND letting us plug our trailer into their water and electricity. Okay, they actually went way over the top — they arranged tennis every day for us. How great is that? It was fun and wonderful to have time together, sharing meals, getting to know one another a little better. We met three of their wonderful grandchildren (and their son, Jeff). They showed us around Ames, Slater, Ankeny, and Des Moines, loaned us out to friends Loren and Becky, and Raj and Chris who we also know from Towerpoint Resort in Mesa. We had a great time with everyone and wouldn’t give anything for the four days together. One hundred miles northward and we arrived in Forest City and the Winnebago/Itasca Travel Club activity grounds. The activity center is the largest factory-owned RV site in the world, capable of hosting the entire WIT membership group at their annual Grand National Rally with up to two thousand Winnebagos and Itasca motor homes visiting. Our NOMADS annual meeting group size is only 160 RVs so we had lots of space to spread out in the rally activity center. We parked on Sunday afternoon, met the neighbors, checked in at the registration table, and rested up for a busy tomorrow. 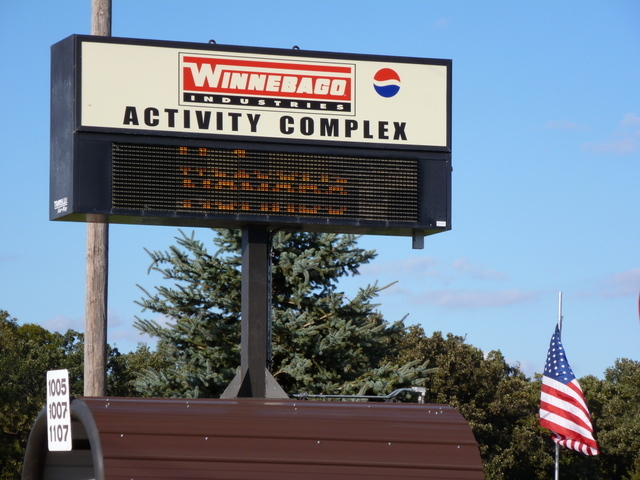 Monday morning we hopped on factory tour buses and spent almost three hours touring the factory and campus of Winnebago’s tremendous production facilities. Wow! It is just amazing how vertically integrated they are, how much automation they employ, and how nicely put together the Winnebago motor homes are. This is a really neat company making a high quality product — we are very impressed. 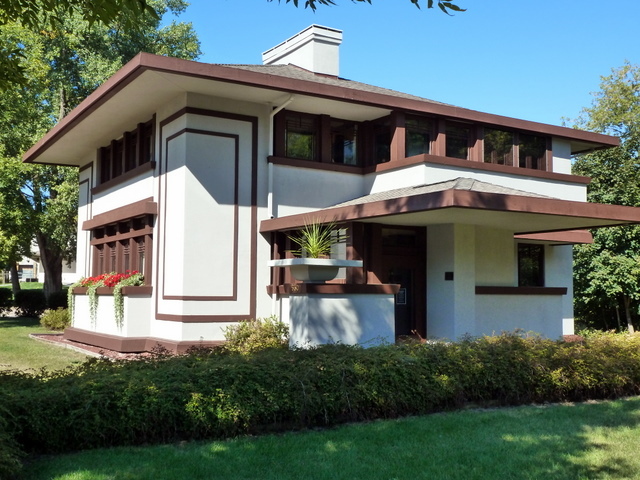 We spent the afternoon in nearby Mason City Iowa touring a pair of Frank Lloyd Wright projects, the Stockman house and the City National Bank and Park Inn Hotel. We started in the FLW interpretive center then walked to the nearby Stockman house. The Stockman house is a wonderfully restored Prairie house. The River City Society for Historic Preservation provided us a wonderful guided tour throughout this historic house. Okay, free time is over, now the show is on. We’re here for the annual meeting of NOMADS, Volunteers in Mission. We’re first-timers, don’t really know what to expect. Didn’t matter. From the first session onward we can tell, this is a gently- but well-organized group. The meeting agendas are fully developed and the group stays on schedule. Leadership is calm, the organizing committee has done their job wonderfully, and the meetings went without a hitch. He explained briefly the significance of each of these three numbers in terms of financial goals and performance of NOMADS. Then he stated, “NOMADS has enough money, at the current rate of spending, to continue operations at least three or four years.” That’s all, that’s the treasurer’s report to the general membership. And why do we want to hear more? He hit the four key indicators, and anyone wanting more information can go read the annual financial report to the Board of Directors. Very refreshing! We attended eight seminars, choosing from thirteen possible topics. Couldn’t attend all, wouldn’t have wanted to. We attended some together, split up a couple of times to cover competing time slots for two good seminars. We attended seminars on painting, sheetrock finishing, skilsaws, convection and microwave cooking, and insurance and tax tips for RVers. A broad range of topics, the seminars were well-organized and presented. Yesterday the Board adjourned the meeting at 10:00 a.m., a few minutes ahead of schedule. We had already made our list of many things we needed and wanted to accomplish before departing today for Arkansas City KS for our three-week mission project. So we headed out from the grounds in our truck for downtown Forest City. Hansen Hardware: going for 200 years? Our first stops included visiting Hansen Hardware store for a saw blade, stopping at the gas station to refuel the truck, and to Farmers’ Coop to refill one of the airstream’s propane cylinders. The hardware store was the highlight of the morning’s errands for us. 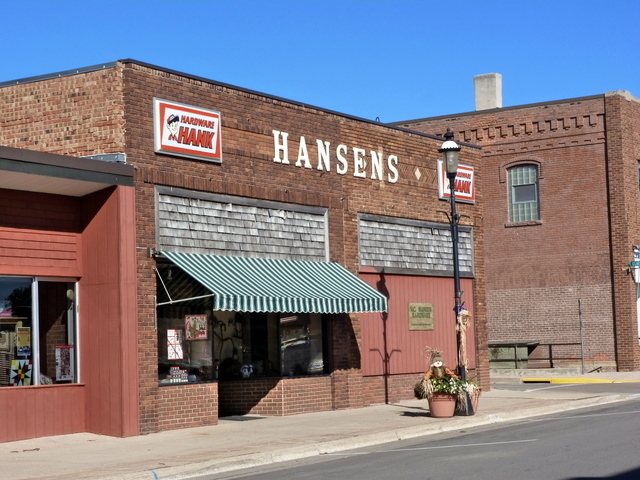 Hansen’s has been family-owned and in business for 100 years and is still a vibrant and well-organized store. We found the saw blade we wanted, a blade wrench (nice surprise! ), and enjoyed browsing the various departments of this general store. 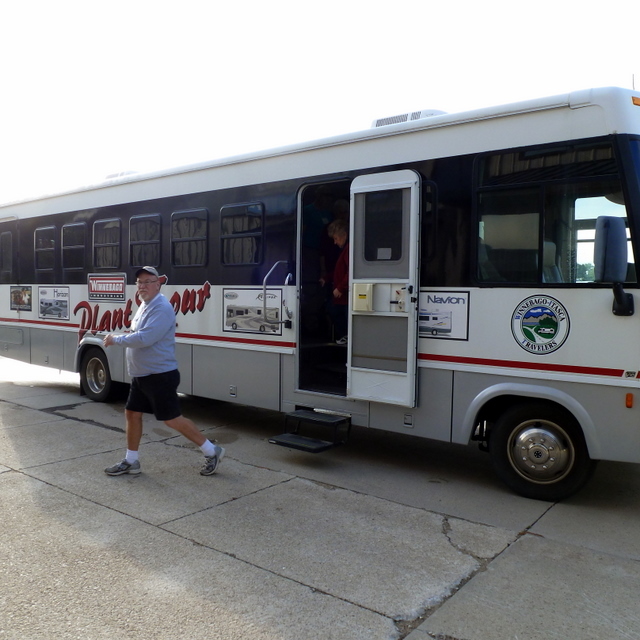 We re-installed the propane cylinder on the trailer and walked to the nearby WIT Club and Winnebago Museum building. We spent our first hour browsing the open motor homes and trailers outside the visitor’s center. We already mentioned the quality we found throughout the manufacturing processes. These were evident in the models we toured too. Our favorites are the Winnebago View, a 24′ motor home on a Mercedes Sprinter diesel-powered chassis, and a 28′ and 30′ Itasca motor home with full-time beds and all the features we would want if we moved into a motor home. No, we have no designs on changing from our wonderful 25′ airstream home. But we do like to look and the Winnebago brand has a lot of good stuff to look at. We spent another hour browsing the museum and visitor center and enjoyed learning a little about the background and founder’s history. But we had to scoot, it was time to play tennis. We had rain and very windy days all week until Friday and also only then gained free time to play. This worked out perfectly — the weather was in the low 60s with no wind and sunny skies. Just right for hitting tennis for an hour on the Forest City rec park courts near Waldorf College campus. Then off to Cabin Coffee before they close — why close at 4:00 p.m.? Because they can? And hey, we can make it there in time, if we don’t stay too long at something else. Apparently this was true for a lot of other people too — Cabin Coffee had a fine and boisterous crowd of teachers, businessmen and RVers stopping in for a cup of the best coffee in northern Iowa. 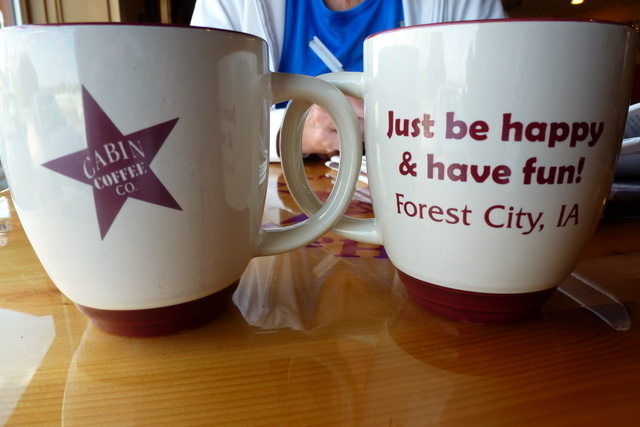 Thanks to Herb and Lois for recommending Cabin Coffee to us. Nice way to end a great week! 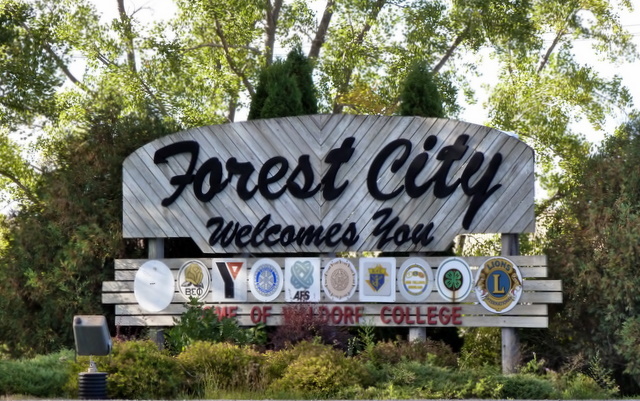 The week ended, NOMADS’ annual meeting adjourned, and the sun set on our Forest City experience. Although we only were there one week we felt already at home. We were with 300 wonderful fellow NOMADS, we were in as friendly a town as we’ve ever visited, and the weather turned nice at the same time we gained free time to enjoy it. This sunset in Forest City is part of our warm memories of our visit, and we’ll look forward to returning.